People in the region have noticed the arrival of monarchs since pre-Hispanic times. In the language of the native Purépecha Indians, the monarch butterfly is called the harvester butterfly, because monarchs appear when it's time to harvest the corn. The Mexican holiday Day of the Dead (Dia de los Muertos) also occurs when the monarchs appear. According to traditional belief, the monarchs are the souls of ancestors who are returning to Earth for their annual visit. 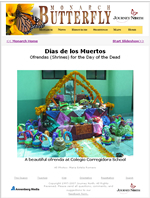 Look at the cover photo and list objects that were used to create this ofrenda (shrine) for Dia de los Muertos, the Day of the Dead holiday that honors the memory of loved ones who have died. Ask questions to guide a pre-reading discussion: Looking at this photo, how do you think Mexicans prepare for the memorial holiday, Dia de los Muertos (Day of the Dead)? How do people around the world honor loved ones who have died? What objects help us celebrate this kind of holiday? Cultures have different beliefs about death and different ways of remembering loved ones who have died. How do Mexicans celebrate Day of the Dead, their memorial holiday in November? 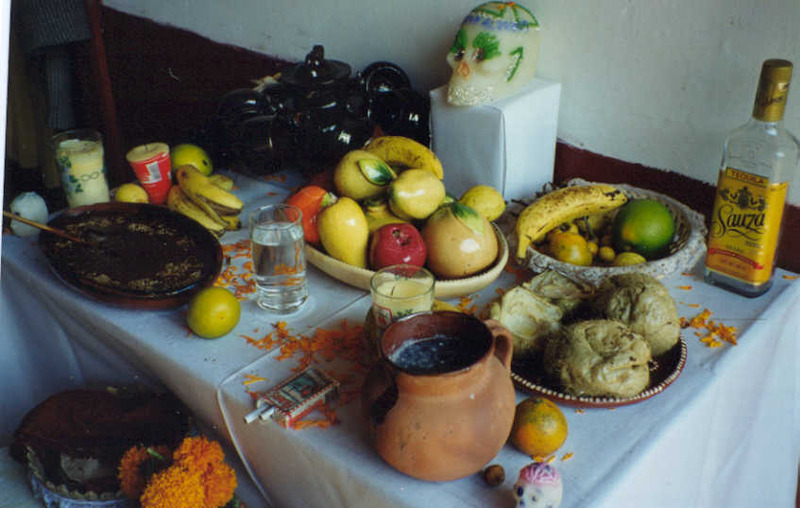 Encourage students to look closely at each photo and ask questions about how ofrendas are made, why marigold flowers are gathered, how candles are used, what traditional foods and drinks are made for the festivities, and more. Explore the customs and unique ways this annual holiday is celebrated. 3. Compare Day of the Dead with Halloween and other Memorial Days. Students may or may not have mentioned Halloween, which occurs at the same time of year. The holiday's historic roots, beliefs, and traditions have given way in the U.S. and Canada to a celebration of candy and costumes. 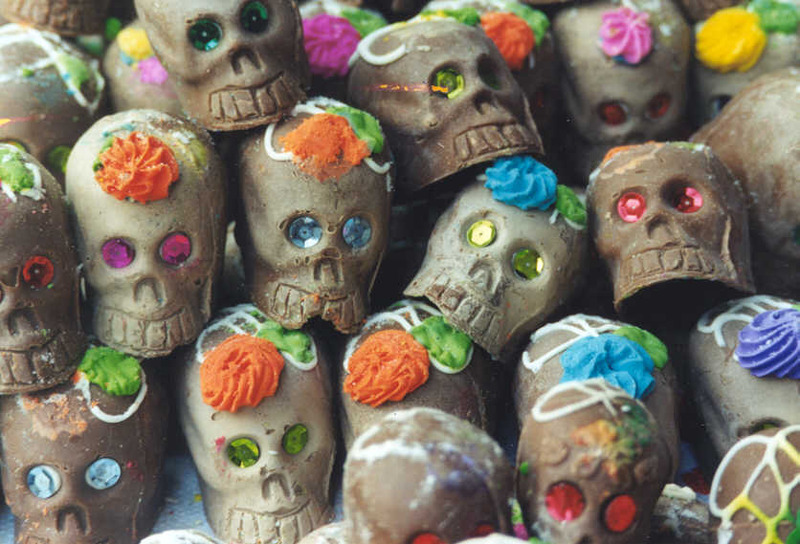 Explore the similarities and differences between Halloween and the Mexican Day of the Dead celebrations; make comparisons to other customs and traditions for other memorial events from around the world. Compare and contrast core beliefs, main activities, foods, clothing, and other items that help people celebrate during these events. These fall holidays have their early roots in yearly seasonal changes and final harvests. People stockpiled food for cold winter months when the sun set early and rose late, and when nature "died" until its rebirth in the spring. What's happening to plants at this time of year? How is daylength changing? Discuss the fact that many cultures have traditions for honoring the dead. For instance, in Afghanistan, people prepare and eat the favorite food of the deceased relative once a week for a month after he/she died. Have students conduct research to learn about other customs. 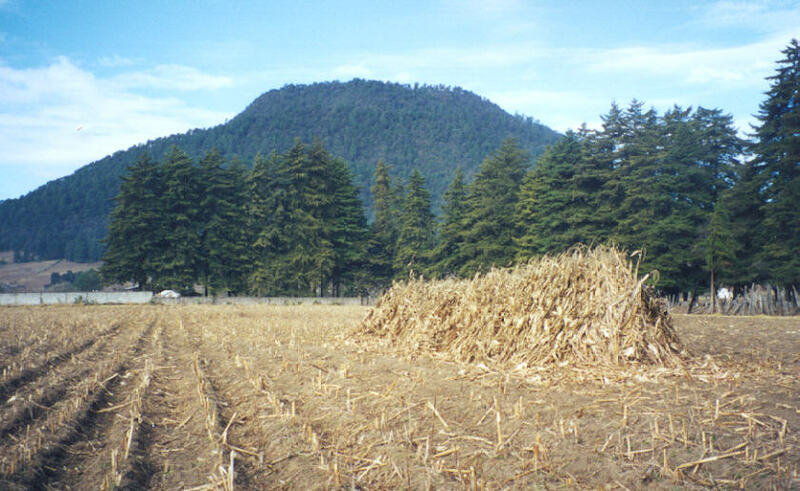 Here is a collection of links about the Day of the Dead in Angangueo, and about corn, tortillas, and the growing season in the monarch overwintering area.